I have Day Two of Baby Week for you today with a soft and sweet card designed especially for my brother and sister-in-law. They are cat lovers and have 2 cats - for me as a very allergic person....this is never easy! But, I knew as soon as I saw this set from There She Goes called Cattitude, it would be perfect for them. Now they also have two kids so these two cats fit perfectly and are so cute with the baby building blocks. I picked up this cute mini pack of paper from Michaels called Baby Boy by Martha Stewart, it has some cute patterns in and some sparkly and shiny designs too. I pulled out this weeks Viva La Verve layout ( 4.25 x 4.25 inch card) and did a little patchwork feel for the card, adding a simple border along the bottom and some cute buttons and ribbon as accent. The sentiment does say Thank You and it's a sweet little sentiment that Julee sent along with my last Verve order...sorry my ribbon covered it in this shot. You can also see a little of the glitter in the starry paper. Sweet enough for a baby boy? Stamps: TSG - Cattitude, Verve - Thank You; Ink: Memento Tuxedo Black, Sage Shadow; Paper: Sage Shadow, Soft Sky, Barely Banana, Flourishes Classic White, Martha Stewart Baby Boy Patterned Paper; Accessories: 1 3/4 Circle Punch, Big Shot, Lacey Circles Nesties, Banana Grosgrain Ribbon, Buttons, White Gel Pen, Dimensionals, Copic Markers, Quilt Edge Punch - Martha Stewart, Square Lattice Embossing Folder. This card is absolutely adorable!!! Love those kitties :) and the colours you used. Oh that's just darling! I think this is my favourite so far. This is so precious Christine! Love the embossed papers, the colors, so soft and sweet, perfectly adorable! 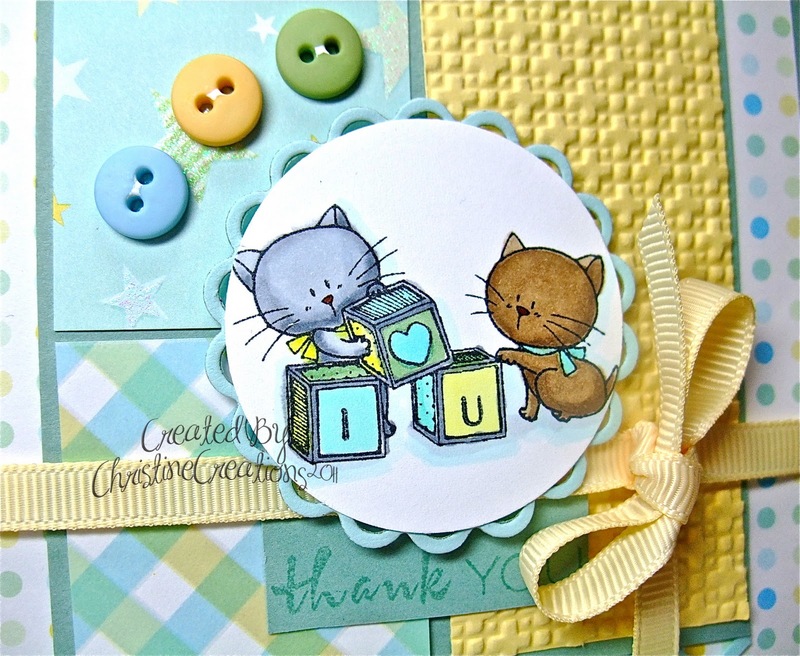 So sweet - love the colors and texture you used behind the kitties. Nice card. Awwww that is so cute, I just love the papers and especially the texture it seems perfect for a baby card! ahhhhhhh this is a sweety too, I like this one more christine sorry. but there is more colors, it's cheerful. This is so darling. 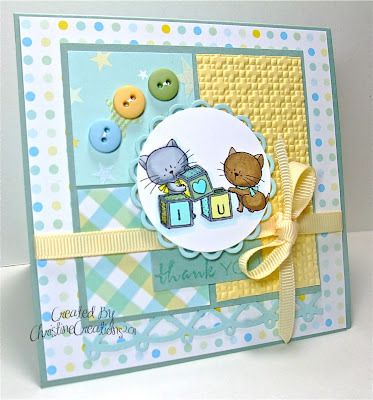 And I've been looking for a good sketch to use up some leftover squares from a baby scrapbook I just finished for a relative - your card is the perfect inspiration! This is just super sweet Christine!! 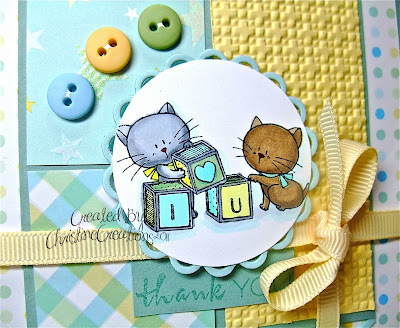 I love the papers and colors as well as that darling little kitten image!! And the waffle textured paper reminds me of a cozy little blanket!! How precious! This is darling Christine!! 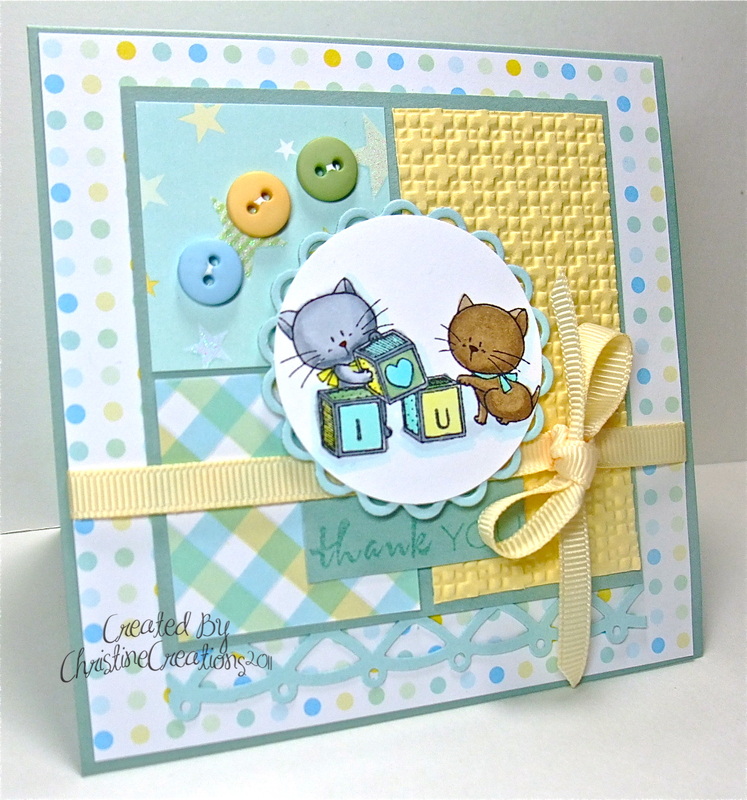 I just love the layout with the squares, your stunning coloring and your design! !Too cute!! Oh my goodness! This is cute as can be, Christine! 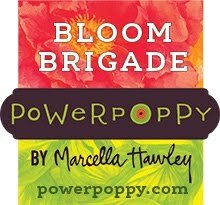 I love the block layout, and the image is adorable! AAAAACK! What a PERFECT baby card girlie! LOVE this!! Absolutely precious, Christine!! I love those adorable images and soft colors (so pretty)! Oh my goodness. Is this EVER CUTE! Wonderful coloring, layout, papers...everything.